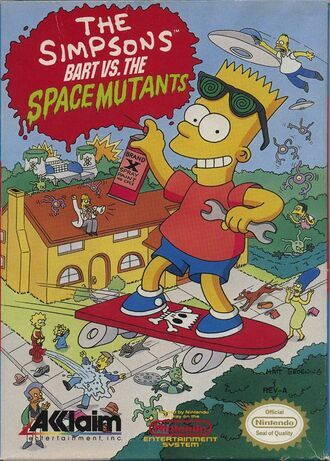 The Simpsons: Bart vs. the Space Mutants is a video game released in 1991 by Acclaim for the Nintendo Entertainment System, Sega Genesis, Sega Master System, Sega Game Gear and various home computers. It is the first game based on the animated television series. Bart vs. the Space Mutants is a 2D side-scrolling platformer. In the single-player game, Bart Simpson is the only one who knows of the aliens' secret plan (his X-ray sunglasses allow him to identify aliens in human form, similar to the sunglasses from the 1988 film They Live, in the words of AVGN) and he has to stop them from collecting the items they need to build their "ultimate weapon" to take over the world. There are five levels, in which Bart must collect or destroy a certain number of these items (purple objects in the first level, hats in the second, balloons in the third, exit signs in the fourth, and nuclear rods in the fifth). If Bart loses a life he says "Eat my shorts!" Another objective of Bart vs. the Space Mutants is to help Bart convince the other members of the Simpson family about the aliens' existence so that they will help him during the levels. In order to get to some of the items and progress through the game, Bart must use equipment such as rockets and cherry bombs, which are bought with coins that can be collected by getting rid of aliens. Bart is controlled on foot and on a skateboard. To get rid of aliens, which are disguised as real humans, he needs to jump on their heads, although some are just regular humans. The game increases in difficulty with each level, and Bart meets up with a boss at the end of the first four. The levels uses elements of The Simpsons and some of the television humor appears in the game: for example, in the first level Bart can make a prank call to the bartender Moe in order for him to run outside so that the player can spray paint his purple apron (an example of an item that the aliens need) into a red color that the aliens do not want. The game includes some minigames. Ridiculous concept. On the first level, Bart has to spray purple items red. Stupid plot. If the aliens can change the ingredients of their machine, WHY CAN'T IT BE GRASS OR SOMETHING?! Terrible controls on the NES and most of the home computer ports. The main music is the Simpsons theme playing over and over, except for the Sega versions, which don't feature the Simpsons theme at all for some odd reason. Jumping and running are both programmed on the A button. This is due to the NES controller only having two buttons. Two hits and you're dead. Only three lives and no continues. The boss music is just the game over music earbleedingly playing repeatedly. Extra lives are rare to find. On the second level, most of the floor is covered in cement, which will instantly kill you. Levels are too long and every time you get a game over, you restart from the very beginning. No SNES version of the game exists despite getting a Sega Genesis port later on. While the first level's object of changing purple items to red might sound silly, it actually provides much more variety in gameplay than the usual platform tie-in games from this era. The third level has several fun sidegames that allow you to rack up extra lives, which really come in handy for the next level. The Sega Genesis port is a BIG improvement over the NES original, with improved controls, far better graphics and audio, more varied (if slightly bland) music, and tweaks to the gameplay that make the game less frustrating. The Sega Master System and Game Gear ports are also improved over the NES versions, albeit not to quite the same degree.